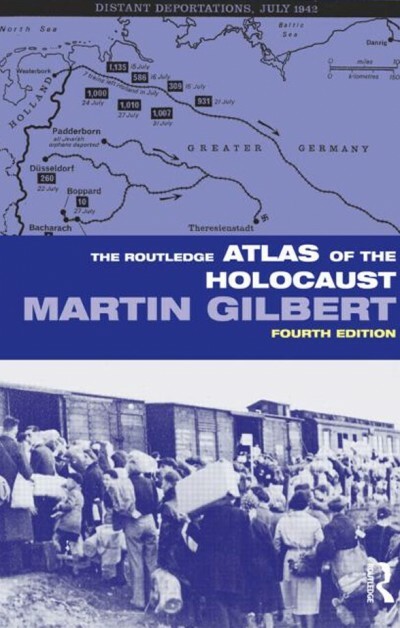 This Atlas presents, through 333 maps, each phase of Hitler’s war against the Jewish people, against all those with Jewish blood or of Jewish descent, wherever they could be found. It traces the German conquest of territory in which Jews had lived for centuries: the first random but brutal killings, the enforced expulsions of ancient communities, the setting up of ghettos, the deliberate starvation of tens of thousands, the round-ups and deportations, the creation and working of the death camps, the slave labour system, the death marches, and the executions up to the very moment of liberation. Text or photographs on each page add description to the maps; the volume includes a Bibliography and itemised Index. “The SS hoped to use this opportunity to deport all of Denmark's 7,200 Jews, most of whom lived in Copenhagen, a few hundred in each of the towns and villages shown opposite. Forewarned, however, of the planned deportation, Danes and Jews plotted to ensure that, on the eve of deportation, Danish sea captains and fishermen ferried 5,919 Jews, 1,301 part Jews (designated Jews by the Nazis), and 686 Christians married to Jews, to safety in Sweden, a country where, between 1933 and 1943, more than three thousand European Jews, including many from Germany itself, had already found refuge.